It doesn't take a hero : General H. Norman Schwarzkopf, the autobiography · One Book. One Author. One Hour. SC&A copy has three pages of yellow legal pages with notes: p. 379 Almost every General had fought in Vietnam and we all remebered feeling abandoned by our contemporaries. Ruth--anti-Vietnam 15 yrs hadn't seen her. 22 Generals and Admirals Nov. 14. I am going to deal absolutely brutally with anyone who compromises classified information. 432 CNN reports inaccurately in trying to get scoops. Memoirs of General William T. Sherman. War is the remedy our enemies have chosen and I say let us give them all they want. Israel. Congress Declaration of War visitors. Civil War--personal memoirs of U.S. Grant. US ranked seventh. National Security Council Meeting. Everybody in the cabinet will feel obliged to talk so might hear some dumb things. Other cal. officers who should have helped assess the new developments seemed quite unprepared. General Mike Dugan--395. Log book, 3,000 pages. 1965--Vietnam I asked to leave W.P. for Vietnam. Major advisor to the ARVN. 1970 Vietnam II--sister was anti-war; Battle commander; Sally and the Sou. Vietnamese. 1983 Grenada. 1983 24th Mech. divisions; Ft. Stewart, Savannah, Georgia. We agreed we would open Grenada to reporters at 5 o'clock the next afternoon because by then Grenada would be ours. Body counts compared to Vietnam, 253. 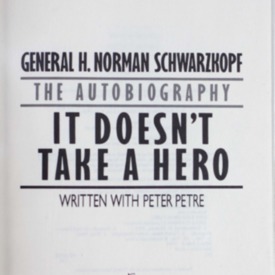 Schwarzkopf, H Norman, “It doesn't take a hero : General H. Norman Schwarzkopf, the autobiography,” One Book. One Author. One Hour., accessed April 19, 2019, http://booknotes.gmu.edu/items/show/228. Program air date: November 22, 1992. In this candid, eagerly awaited autobiography General H. Norman Schwarzkopf reveals the story of his remarkable life and career. Here is the story of his boyhood years during World War II and a unique adolescence spent in the Middle East and Europe that would later prove invaluable to his understanding of the Gulf. Here, too, is a frank account of the West Point graduate's early disillusionment with the real" Army - a disappointment that nearly prompted him to leave the military." "General Schwarzkopf speaks openly about his two tours of duty in Vietnam. He recounts the "dark years" that followed, and his own role in the struggle to reform the military." "For the first time ever General Schwarzkopf provides his personal, behind-the-scenes account of Desert Shield/Desert Storm, including candid portraits of such major figures as Colin Powell, Richard Cheney and President George Bush. From the general's unique perspective we experience firsthand the complexities of coordinating the campaign in a country deeply suspicious of foreigners; of maintaining strategic secrecy during America's first internationally televised war; and of ensuring that this war would not be another Vietnam." "Thoughtful and provocative, It Doesn't Take a Hero is an intensely personal portrait of an American life, the triumphant journey of a soldier who set his star by a simple but timeless motto: duty, honor, and country." --Book jacket.